The numbers are in and it's time to tally up the totals for 2016. For the first time this year we will be reviewing both UK and Euro originations. 2016 was characterised by a sharp drop in originations in April and the depressed level was sustained for 5 months as shown in our latest Chart of the Week. However, September came roaring back posting an all-time record followed by another record in October and November kept the pace. Ultimately, December ended the year enigmatically by coming in well below the trend. Originations ended 2016 at £3.9bn compared with £2.8bn in 2015. While year-over-year growth was robust at 36% it was roughly half the 76% YoY growth in 2015. Over the last 3 years volumes maintained a compound annual growth rate of 44%. In terms of sector share, all this growth is occurring in P2P lending. Equity crowd funding actually declined marginally in 2016 and is hovering around £150m in new deals a year. Asset class shares within P2P have remained very consistent. For the last 2 years SME lending has respresented around 45% of the volume while consumer and invoice lending have 38% and 12% respectively. For the first time also this year, we are presenting league tables for the different asset classes. 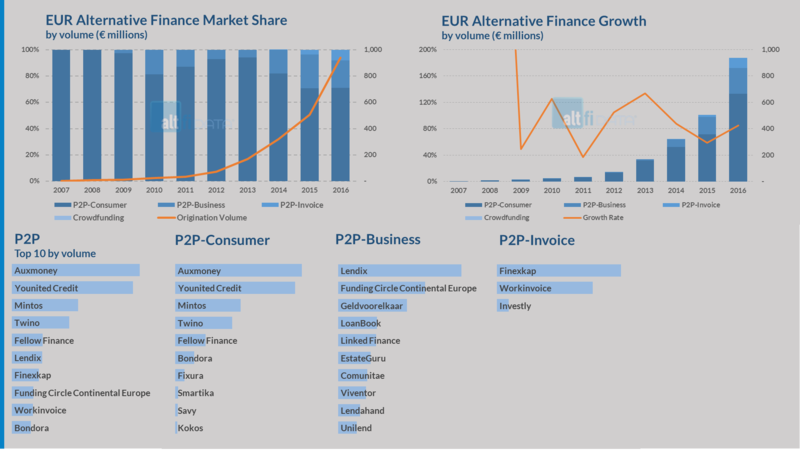 Funding Circle and MarketInvoice are dominant in SME and invoice lending. In consumer lending Zopa and RateSetter together dominate. These four platforms have continued to show strong double digit growth, but Funding Circle really surged forward in the latter part of the year and was the first platform to originate more that £100m in a single month. While in 2015 Zopa, RateSetter and Funding Circle were evenly balanced, in 2016 Funding Circle now clearly generates more volume. In 2016 we are seeing evidence of the field spreading out. While growth rates for the larger platforms have declined to robust double digits, some smaller platforms are still growing at impressive triple digit rates, notably: Assetz Capital, Lendable, Abundance Generation, SavingStream and MoneyThing. European originations never experienced the 5-month lull that the UK did. Euro volumes finished the year at over €930m coming very close to breaching the €​1bn mark. This is compared to €​500m for 2015 resulting in a YoY growth of 85%. This growth rate undrelines how EUR lending did not suffer the retrenchment that lending in the UK and US did. In terms of asset class share, 2016 saw significant growth in invoice lending resulting from strong growth in volumes at Finexkap and Workinvoice as well as the addition of newcomer Investly. Unlike the UK, in Europe consumer lending dominates at over 70% share while SME and invoice lending have 20% and 8% shares respectively. That's 2016 in review. Later this week we will review our predictons for 2016 and make some new ones for 2017.